Bruce HaleThe school visit is that thing which strikes terror into the feeble hearts of many authors and illustrators. The speaking. The weird cafeteria smells. And the children ... good gravy ... the children. If you're one who gets the vapors at the thought of school visits, then you need to spend some time with Bruce Hale, one of the most talented presenters in the business. He also offers fantastic writing tips here. The newsletter is always a useful mix of information and motivation. Bruce kindly answered a few questions for Team Blog. Registration for the 40th annual SCBWI conference ends Monday, July 18. If you're going, get excited. If you're missing out, think of this as a consolation prize (and don't forget to follow the official conference blog and Twitter hashtag). 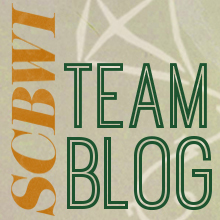 What can people expect to learn from you this summer at the SCBWI-LA conference? My session covers how to craft a dynamite presentation for school visits, Skype sessions and conference talks. Attendees will learn how to be comfortable speaking, how to construct a talk that draws from their strengths and moves their audience, and the key elements that every presentation should possess -- among other things. We'll also have time to fine-tune a part of the attendees' presentations. What’s been your favorite book to work on, and why? So far, I'd have to say the second Chet Gecko mystery, THE MYSTERY OF MR. NICE. I'd just signed a three-book contract and was so totally stoked and on fire, that the plot just jumped from my fevered brain. That was the easiest writing and most "in touch with the flow" experience that I've had so far. But I'm always hoping the next book will top that. What do you wish you’d known when you started writing for children? I wish I'd known how to write the authentic stuff, the stuff that really comes from my passions -- rather than what I thought would make a cute children's book. It took me years to learn that lesson. You don’t seem like you get stage fright—not a bit! But for those of us who get the wobbly knees when we’re facing people instead of blank pages, what advice do you have? True, I'm one of those oddballs who actually enjoys public speaking. For those who get stage fright, there are a number of tips I've heard. My best advice is: know your material cold; remember to pause and breathe; and connect with your purpose for being there. Ultimately, it's all about the audience, not about you. Of course, you could always follow that old advice about picturing your audience naked, but I've found that rather distracting. What are your three best tips for people looking to take their writing to a new level? Get in touch with your passions, your hopes and fears from childhood. Chances are, what moved you then will move you now. Write about these things, not teen dystopia or vampires or whatever's currently trendy. Find someone (or several someones) who understands what makes for a good story and will give you honest feedback. We've all got blind spots, and a trusted reader can clue you in to yours. Take risks. Try something new that you're not sure you can do. Whether that's taking a poetry class if you're not a poet, or studying songwriting to help your picture book writing, whenever you stretch creatively, you grow.